The Bonavista Peninsula in eastern Newfoundland provides a glimpse through time – both geological and historical. As you encounter icebergs, whales, seabirds, and wildflowers, you are also on a journey through the ancient past as recorded in the land and seascapes, exposing rocks that are more than a half-billion years old. As you travel along the Discovery Trail, which spans the coast of the Bonavista Peninsula, you will experience stunning vistas as you learn about the rocks in the area. You will have the unique opportunity to glimpse nature’s early evolution and see spectacular, 565 million-year-old Ediacaran fossils – enigmatic soft-bodied organisms that populated the ancient seas. The Discovery! 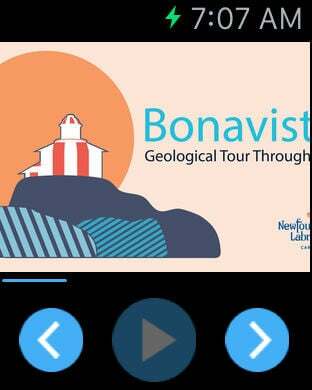 Geological Tour app contains a driving tour that highlights the geology of the Bonavista Peninsula of Newfoundland and Labrador. The app currently contains a tour with 35 stops and some of the stops require hiking from a parking location. Each stop is described with associated images of the location. Download the tour before heading out so you do not need to worry about accessing mobile data. The tour includes a map showing the location of the stops. Based in part on spectacular geology, the area is an aspiring UNESCO Global Geopark – the Discovery Aspiring Geopark Inc. Additional information on this initiative can be found online. Additional information on the sites and interpretations were provided through working with the DAGI and various contracted reports provided to them.